If you’re hungry and in a hurry, Wee Winks Market is the place to go. This Duck NC deli has everything you need for breakfast, lunch, snacks or a beach picnic. For breakfast you might choose a breakfast sandwich. Who doesn’t love a biscuit, bagel, croissant or toast with egg and cheese? The only thing better is to add sausage, bacon, country ham or Taylor pork roll. Winks also offers a killer Breakfast Burrito stuffed with egg, choice of meat and sautéed onions, peppers, tomatoes and jalapeno. If you have a sweet tooth, there are pastries too – muffins, crumb cakes, apple fritters, cinnamon buns and more. And of course they have fresh-brewed coffee to make your breakfast complete. 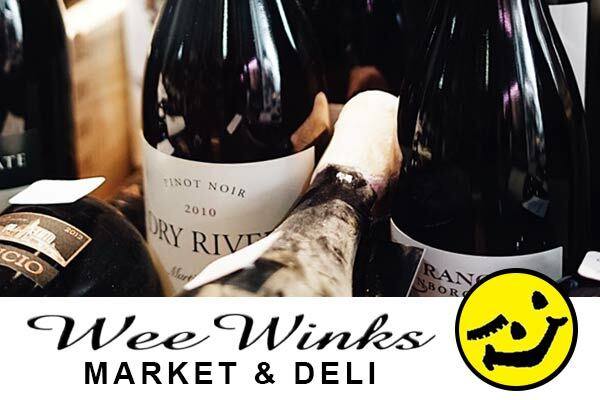 Wee Winks Market has your Duck NC lunch, dinner and picnic needs covered too. For lunch or dinner, the deli menu offers everything from a healthy chef salad topped with turkey, ham and fresh veggies to an Italian sub stacked with salami, ham, pepperoni, provolone and all the delicious fixings. You can choose a sandwich from the menu or create your own sub or wrap with a huge variety of meat, cheese and veggie options. Gluten-free bread is available. Everything you need for a beach picnic can be found at this Duck NC deli. Options like chicken salad, tuna salad, cole slaw, potato salad, egg salad, macaroni salad and Greek salads are easy to take to the beach, or you can buy bulk meats and cheese and make your own sandwiches. The Duck NC market also stocks all the condiments, snacks, chips, cookies and drinks you could want, including Duck’s largest selection of craft beers and wines. Be sure to pick up dessert here too – cupcakes, brownies, key lime and lemon bars and so much more. Check the Wee Winks Daily Specials page for daily offerings.